L A Surfacing - Builder, Cleaning Services, Driveways/Patios/Paths, Fencing/Gates, Landscaper , Plasterer based in Epsom, Surrey. 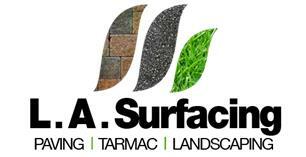 L.A Surfacing are a reliable family run business based in Surrey. With over 10 years experience L.A Surfacing are guaranteed to deliver you a professional and quality service. We take pride in our work and treat every job with detailed care and attention. We are able to give you an honest and competitive quote tailored to suit your requirements. Banstead, Cheam, Crawley, Epsom, Ewell, Kingswood, New Malden, Reigate, Tadworth, Worcester Park.